Congham smock mill was probably built on the site of the older postmill at Mill Farm that could well have been demolished to make way for the smockmill. The mill used 2 pairs of French burr stones and a flour dressing machine. A horse mill was also being operated on the premises in 1819. To be Sold by Private Contract. A Desirable old established SITUATION now in full trade, comprising a Smock Mill with two pair of French burr stones, a new flour machine & all going gears complete; also a good horse mill with a granary over the same, together with a convenient Dwelling house, barn, stable, cart lodge & all other necessary outbuildings, with 11 acres of Arable Land (more or less) all Freehold and situate at Congham within 7 miles of Lynn. Further particulars may be known by applying to Mr. Wm. Riches, the proprietor, on the premises. A Very desirable FREEHOLD ESTATE situate in Congham within 7 miles of Lynn, consisting of a sunbstantial Wind Mill with two pair of French burr stones, flour dressing machione & going gears compleat, a horse mill with large granary over the same, a good dwelling house, barn, stable, cart lodge & requisite outbuildings all in good repair, with 11 acres (more or less) of arabel land thereto belonging. The above premises are in the occupation of Mr. William Riches, the proprietor, who has a very considerable trade. Possession will be given at lady day next. Apply to Mr. Riches who will shew the premises or to Messrs. Jarvis, Attornies, Lynn. 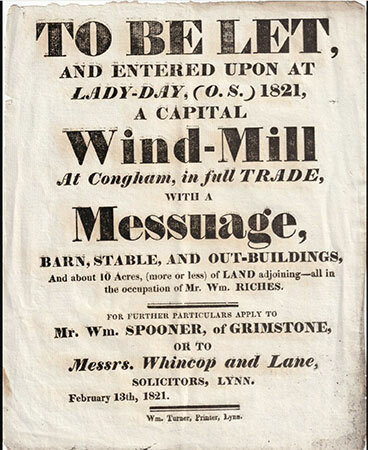 A Capital Windmill at Congham in full trade with a messuage, barn, stable & outbuildings & about 10 acres (more or less) of land adjoining, all in the occupation of Mr. William Riches. For further particulars apply to Mr. Wm. Spooner of Grimstone or Messrs. Whincop & Lane, Solicitors, Lynn. February 13th, 1821. Together with two pairs of stone gearing & fittings as the same now stands. Sale at 11 o'c . Cata logues of the Auctioneer, Queen Street, Lynn.